A baby orangutan being tickled. Photo from Discovery News. We’re not the only species that are capable of laughing according to new study. Great apes are able to laugh like humans too, and they do it frequenty. This finding suggests that the last common ancestor of humans and apes also laughed around 10 to 16 million years ago. The ability to laugh subsequently evolved among apes and human, resulting in distinctive ways of laughing among them. “Orangutans produce a short laugh series of noisy calls. Gorillas, chimps and bonobos produce longer laugh series and the calls are produced more rapidly” said project leader Marina Davila Ross, a primatologist from University of Portsmouth. With partners Michael Owren and Elke Zimmermann, Davila Ross recorded over 800 recordings of 22 juvenile and infant apes, and also three human babies laughing as they were tickled in their palms, feet, necks and armpits. Presented in the latest edition of Current Biology, the study shows that human laughter is most similar to that of chimpanzees and bonobos, followed by gorillas and orangutans. Human laughter is least similar to those of siamangs, a lesser ape. “These results coincide with the genetic topology of great apes and humans,” said Davila Ross. She doesn’t rule out if apes or monkeys have a sense of humor but said that “it is difficult to find a method to accurately test it”. Read the rest of the article from Discovery News: Chimps, Other Apes Laugh Like People. I wonder what function does laughing serve in primates. “She doesn’t rule out if apes or monkeys have a sense of humor”. Really? René, I’m not sure if the Youtube clip conveys the fact that gibbons have a “sense of humor”. It appears that the gibbon pulled the dog’s tail, twice. I don’t see the correlation or evidence from the clip that would support gibbons have a sense of humor. Unfortunately I cannot explain or speculate why the gibbon did that from a short clip. im not sure why this would come as a shock at all. anyone who has a pet or even spent more then 2 mins around a primate, should be insulted how much money must have been wasted persuing this discovery! clearly we are not the only animals who have outward shows of joy. Danielle, while we feel like animals (esp. our pets) show signs of joy, we cannot be sure scientifically if they indeed do ‘laugh” and what role laughing fulfills. We must be careful not to anthropromorphise animals (esp. primates) with human quality. One good example is smiling. Some primates smile to show submission (not because they are happy). This study not only prove that great apes laugh but it suggest that laughing started and had evolved since our last common ancestor. However, one question still remains. Why do great apes laugh? Primates have their own ways, just as humans. If it feels good, do it. If it hurts, what then???? We may not smile the same way, primates express joy in the primate way….. Laughing does not denote a sense of humor. However, it would be an indication of the possibility. 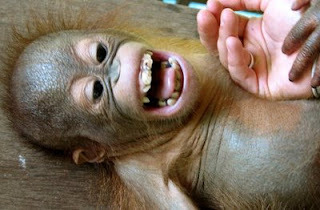 Do apes make each other laugh without physical contact? Are there certain apes that appear to be more silly than others? In ape courtship, is there laughing?